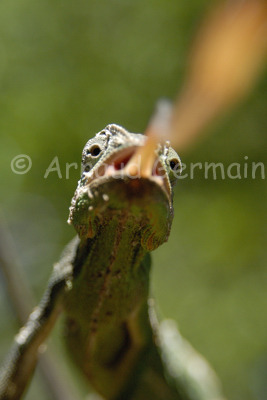 I took this picture of Camille, my pet chameleon at home. Camille would accept grasshoppers from our hand so I thought I might make the most of the situation and do something a bit different. I wanted to take a picture of the chameleon striking towards the camera. I put Camille on a branch, set up my camera on a tripod with a 105mm macro lens, then I placed a grasshopper on top of the lens. Chameleon's eyes are fascinating: the only time they look at the same thing is when they are about to strike. I took a series of shots as Camille was getting the grasshopper, and this is my favourite.